Each one of the hundreds abducted is a hero for joining the flotilla. Patriarch Hilarion Capuchhi who was jailed in Israel for many years and lived in Italy was one of the abductees. Sheikh Raed Salah, a Palestinian from the areas occupied in 1948 who is head of a branch of the Islamic movement. Hedy Epstein, a 86 year old Jewish women who lost her family in Nazi concentration camps and subsequently came to Palesttine and was shocked to see people claiming to represent Jews mimic some Nazi crimes (and for this the Israelis strip-searched and humiliated this elderly woman). There was Nobel peace laureate Mairead Corrigan-Maguire. There is Joe Meadors, a survivor of the Israeli attack on the USS Liberty (on a US ship in International waters that killed many good Americans in June 1967 but that political considerations buried this Israeli crime - see survivor webpage http://www.usslibertyveterans.org/ ). For Israel to repeat its atrocity against US citizens as the US commemorates Memorial Day is unconscionable (see also http://www.freepalestinemovement.org ). For the Obama administration to continue to shield Israel from International law makes us angry. Those of us angry enough to get out and demonstrate here in the West Bank have a problem. In Bethlehem, over 50 members of the "Palestinian Preventive Security"� (as they are called) and police blocked our path to get to the apartheid wall area. We are told we can demonstrate as long as we do not bother those we are demonstrating against! Over the past few years, Palestinian authority heavily armed forces blocking roads had an amazing psychological impact on Palestinians and Internationals. No popular resistance can survive this. Popular resistance by definition involves increasing the cost to the occupiers and acts of civil resistance including disruptions. Popular resistance is not to be reduced to standing at the sidewalk carrying a flag or a sign. 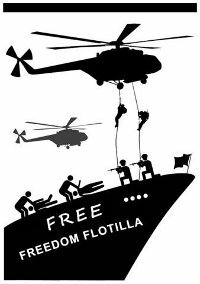 They involve daring and risky actions like the ones taken by the thousands of us who mobilized for the freedom flotilla. Elite 'leaders' in Ramallah and in other Arab cities gave the rhetoric that they support the popular resistance as exemplified by the freedom flotilla. But words are cheap and words spoken in public are not the same as behind closed doors and in corridors of power. Even the rhetoric is not consistent. A key Palestinian leader once stated that such humanitarian boats to Gaza are stunts with no real impact. The Palestinian leadership that promised us no negotiations until there is a settlement freeze has engaged in negotiations while we see continued settlement activities all around us both in East Jerusalem and in other Parts of the West Bank. Instead of closing Israeli embassies in Arab countries, they were heavily protected by Arab security forces from demonstrators. Thus, it is not totally surprising that there was a larger demonstration yesterday in Sweden (7,000 people) than in Ramallah or Amman. But will this attack on the freedom flotilla be the straw that breaks the camel's back? Or will other events come that surprise us? The larger atrocity this year is not the attack on these ships in International waters and the kidnap of 750 peace activists. The larger atrocity is the ongoing murderous siege/blockade on Gaza and the methodical destruction of life for Palestinians in the occupied territories. After the slaughter of 1400 in Gaza and thousands of homes destroyed, there was intensification of the siege that prevented rebuilding and other humanitarian supplies from reaching Gaza. Not able to do so, some money destined for Gaza rebuilding was siphoned off for elite Palestinians who claim to work for the people. Slowly Arab Jerusalem is erased off the map. villages around the city are squeezed (some like Al-Walaja and Wadi Rahhal are targeted for complete ethnic cleansing). What prevents its resolution base on justice to achieve a durable peace is not only the Zionist war machine but the countries that enable this. Turkey recalled its ambassador while Egypt and Jordan kept theirs in Tel Aviv and Egypt shamelessly collaborates in blocking Gaza at the order of Israel and the US administration. Palestine brings the best in people who have dignity and self respect and brings the worst in others who have tribalism and greed coursing through their veins. There was more dignity in any minute of the short life by Rachel Corrie who stood in front of the Bulldozer in Rafah and lost her life than is represented in lifetimes of by kings, prime ministers, and presidents. There was more dignity in the bloody T-shirt of Basem Abu Rahma when he was shot and killed with a gas canister in Bil'in than among all the palaces of rulers who gather in an Arab summit. And the dignity of one drop of blood shed in the Mediterranean is more than exhibited at the UN Security Council last night. Citizens of Greece and Turkey joined together in the freedom flotilla ships and in the Israeli detention centers. Zionists were out saying there is no humanitarian crisis in Gaza and politicians behind closed doors are trying to limit the damage to their reputation instead of asking themselves questions about their direction in life! If humanity survives the next 100 years it will have been because of those who act with dignity/self respect instead of cowardice and self-interest. Lessons in dignity from those like Rachel, Basem and the freedom flotilla will be required study in the new people's history books, which I am sure will be very different than those we have in schools today. It is thus fitting that one of the freedom ships now kidnapped by the pirate navy was named 'the Rachel Corrie'. As I wrote in a number of articles, I am optimistic despite the challenges. Why: because of Basem, Rachel (the person and the Ship), the thousands of martyrs who sacrificed their lives for freedom and justice, tens of thousands injured, the millions around the world in solidarity, and most of all those Palestinians and other Arabs who have not sold their souls and who maintain the faith in the justice of this cause. In the demonstrations yesterday, a child in Gaza was carrying a sign that says 'we demand freedom' and a child in Cairo that says 'children in Egypt and in Gaza want the siege lifted'. That is our future - not elderly politicians meeting to do media damage control with empty words. Even as we mourn the martyrs, humanity won another victory yesterday.